St. Louis Public Schools superintendent Kelvin Adams listens as SLPS parents Maxine Johnson outlines her concerns with the 2011-2012 spending plan. 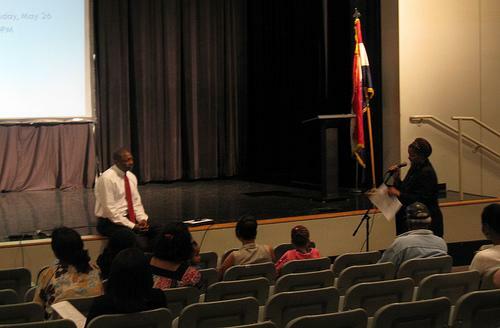 A respectful crowd of 85 parents and district activists filled seats at Vashon High School Monday night seeking some clarity on the 2011-2012 budget for the St. Louis Public Schools. Kelvin Adams, the district's superintendent, says he understands the concerns participants expressed about the financial situation of the district. The budget numbers are not nearly as bleak as last year, when the district had to eliminate 500 positions, including some through layoffs, and shutter six schools to close a $57 million gap. But the spending plan for next school year does include cuts to transportation and support staff. Some of those cuts to parent educators and supplemental teachers are due to the loss of federal stimulus dollars. And those cuts bothered Donna Jones, the vice president of the currently-defunct elected school board. "A lot of our students are having some really serious issues like alcoholism, drug abuse, not having anyone at home, and we don't have the people that come and follow through," she said. Adams said he's evaluating ways to increase transportation spending and keep librarians, rather than just library aides, at some schools. "But at the end of the day, there are a limited number of dollars, and we can only spend those dollars one way," he said. The 2011-2012 school year also marks the first time that principals will control staffing levels at their schools. Adams said he is working with those principals to ensure they feel comfortable with the process, though he acknowledged the funding may not be there for everything they feel they need. Online comments will be accepted until May 16. Adams hopes for a final vote on May 26. Three schools would be closed, and several others would undergo vast transformations, under a $273 million dollar budget proposal unveiled last night by St. Louis Public Schools superintendent Kelvin Adams. The proposed spending plan also marks a shift in budgeting philosophy for the district. Money in the past has been distributed to schools based on the number of people that work in the building. Starting next year, the money would be allocated as a grant to schools based on several factors, including the percentage of special education and low-income students, average daily attendance, and whether the school is a magnet/choice school. Within reason - for example, they'll still have to meet state class size limits - principals will be able to set their own staffing plan. "The whole challenge for a principal is to have ownership, and have control of the resources," said Adams, a former principal. "If I decide I want to have a larger third grade class - I have a great, dynamic third grade teacher, I'll put that teacher in that classroom," Adams said. "But I may have a smaller fourth grade class because maybe things aren't working as well in my fourth grade group." More details are after the break. Saying the process of collaboration is not what it should have been, St. Louis Public Schools superintendent Kelvin Adams delayed tonight presenting his budget for the 2011-2012 school year. 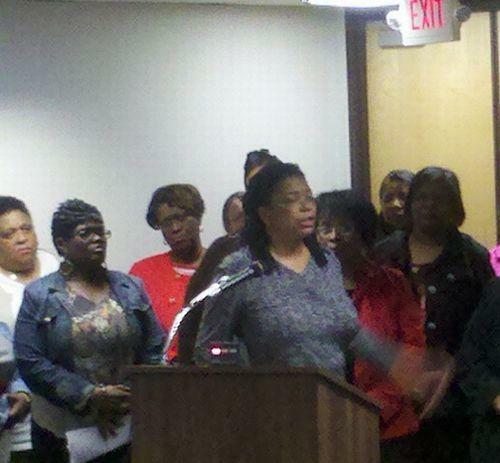 The budget is likely to include layoffs and the closure of as many as three schools. Letters have already gone out to the parents at Bunche and Stevens middle schools, and Kottmeyer Big Picture High School, and library and media specialists from the district were out in force to protest the possibility that some of them may lose their jobs.